BioZyme Inc., leaders in natural nutritional supplements for livestock, has been named the exclusive nutrition company of Superior Livestock Auction’s new value-added nutrition programs – VitaFerm® Raised and Gain Smart™. “Until now, through Superior and its value-added programs, all of the information was available to cattle producers in terms of vaccination programs and potentially what genetics these cattle were out of, but one of the things that we had been missing historically is what type of nutrition these cattle were on. So, we at BioZyme and the folks at Superior Livestock Auction have decided to bring this to the forefront to provide this information not only to the buyers, but to the general public to help educate them on the importance of nutrition in these cattle,” said Alan Lee, BioZyme Director of Sales (South). Good nutrition has come to the forefront as one of the keys to healthy, profitable cattle, said Jason Barber, Manager – Superior Livestock Auction Purebred Division, so offering a value-added program focused on cattle nutrition just made sense. BioZyme’s natural supplements, including VitaFerm and Gain Smart brand products, are specifically formulated to promote proper rumen fermentation and gut health through its proprietary prebiotic, Amaferm®, along with a balanced nutritional profile of minerals, proteinated trace minerals and vitamins. To qualify for the VitaFerm Raised program, calves must have been raised on a VitaFerm-fed dam or fed VitaFerm brand products through pre-conditioning for a minimum of 45 days prior to marketing through delivery. VitaFerm products, available in a loose mineral, protein supplementation and tubs, are formulated specifically for the cow-calf segment and have been research-proven to maximize energy and forage utilization for on-target efficient nutrition, boost conception, minimize heat stress, get calves to the bunk sooner and maximize weaning weight. 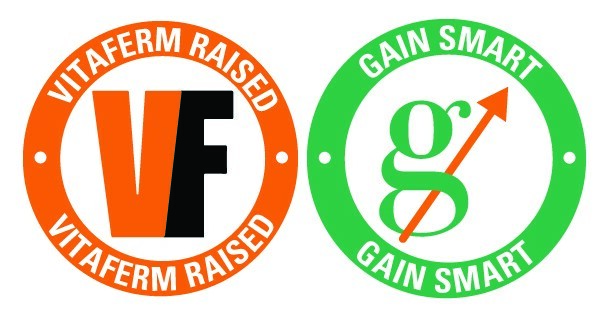 In order to qualify for the Gain Smart program and qualifying emblem, calves must have been fed a Gain Smart mineral for a minimum of 45 days through backgrounding or a grower yard situation prior to marketing through delivery. Gain Smart is one of the newest BioZyme brands designed specifically for the stocker and yearling segment of the industry. The Gain Smart loose minerals, drenches and tubs make the most of the cheapest feed available to any stocker, accelerate gain by stimulating the calf’s rumen to function at top efficiency, improve health by reducing the impact of stress, and pay a 3 to 1 return through more gain and better health. For more information about either value-added program, visit www.biozymeinc.com or contact BioZyme Inside Sales at 816-344-5748, a BioZyme Area Sales Manager or your Superior Livestock Auction representative.